We have a strong following for Mouseman furniture. If you are considering selling any items, please get in touch with our furniture expert Robert Stones for a free appraisal. For larger collections we can even offer free transport from anywhere in the UK. Born in 1876, Robert 'Mouseman' Thompson was an expert carver and furniture maker working with English oak. Thompson specialised in producing furniture based on 17th century styles, with his own twist, in his workshop in Kilburn, Yorkshire. He was nicknamed ‘the mouseman of Kilburn’ , or ‘Mousey Thompson’, as each piece after about 1920 was marked with a carved mouse as a mark of quality and craftsmanship - hence his furniture became known as Mouseman Furniture. The practice apparently started as he was carving a church screen, and one of his craftsmen remarked that ‘we are all as poor as church mice’. The mouse carving is an important indicator in assessing the age of a piece, as it changed subtly in style over the years. 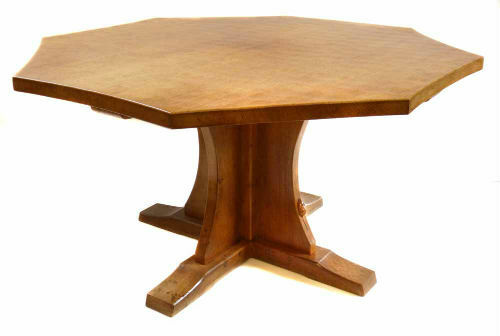 Although Robert himself died in 1955, Robert Thompson Craftsmen Ltd is still in business in Kilburn, producing fine English furniture of all styles. 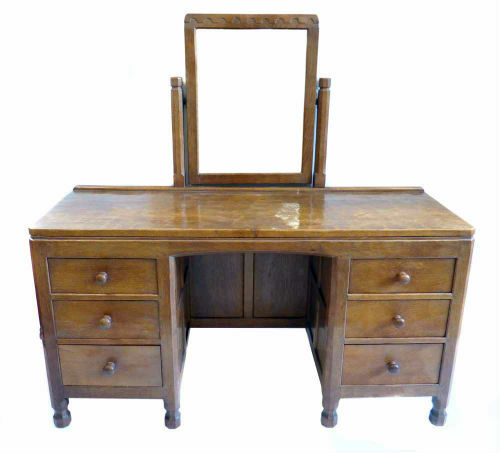 With their clean, simple lines, careful workmanship and classic construction, Mouseman furniture holds its value well at auction, being functional as well as collectable, and interest always remains strong in the market. The value of Mouseman furniture and other work varies according to the type of piece, age and condition. Smaller decorative items such as cheeseboards, fruit bowls, candlesticks and book ends are greatly in demand, as are larger pieces. The most sought after items are those made during Robert Thompson’s own lifetime, but more modern pieces, including those made during the 60s, 70s and 80s in the Kilburn workshop are still popular. Robert "Mouseman" Thompson table and six chairs. Robert "Mouseman" Thompson "X" framed dressing table stool. Robert "Mouseman" Thompson bedside locker.